lessons start at 10 years of age or older. We have students of all ages from children to adults. For younger children we highly encourage a parent to sit in on the lesson to help the student at home with things such as posture and hand positioning. Violins are sized by the following measurements: 4/4, 7/8, 3/4, 1/2, 1/4, 1/8, 1/10, and 1/16th. 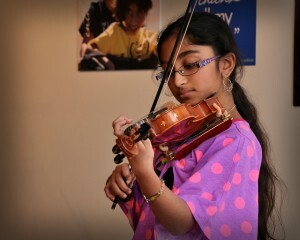 The 4/4 or full size violin is generally used by students aged 11 and up through adult. Click http://www.fiddleheads.ca/shop/violin-sizes-viola-and-violin-size-chart.htm for a complete sizing chart for violin and viola. What is a fiddle? Fiddles are usually violins used to play folk music. Violas and cellos can also be referred to as fiddle music when playing certain types of music. Violas are a little bigger version of the violin and are sized by the following measurements: 12″, 13″, 14″, 15.5″, 16.5″. The 12″ viola is very close in size to the 1/2 size violin and therefore students are usually older starting out on viola. See complete information on viola sizing at the above link. Cellos are typically either 4/4, 3/4, 1/2, or 1/4 size. Most adults play the 4/4 size cello although there are 7/8 sized cellos available for smaller adults who have difficulty with the full size instrument. See detailed information on sizing for cello here: http://musicshowcaseonline.com/cello_sizing.asp. Double basses, like cello commonly come in 4/4, 3/4, 1/2, and 1/4 size. There are also 7/8 sizes available. Unlike the other stringed instruments, it is most common for adult students to play a 3/4 sized bass. Visit https://www.gollihurmusic.com/faq/2-SIZES_DOUBLE_BASS_SIZING_FAQ.html for complete information on sizing for double bass. Renting instruments is very popular with strings with young students because they rapidly change size. Contact us today about rental options!